The Williamsburg, a traditional-styled wing back lift chair that looks great even in a formal living room setting. The Comforter PR-502 Heavy Duty Bariatric Lift Chair, an infinite-position lift recliner that can support users weighing as much as 700 pounds. 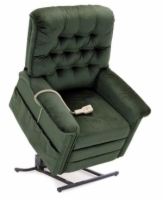 The LC-900 Media Lift Chair, which is made especially for watching television for extended periods of time and is best accessorized by the Media Wedge, a companion arm rest console with built-in storage space and cup holders. The LL-770L Lift Chair Bed, a large lift chair that is packaged with a full-length mattress for long naps and overnight sleeping. The Pride Leather Lift Chair, with cascading pillow back cushions. This is the only chair in our product catalog which is upholstered in genuine leather.